The solo project of Boulder, CO-based sound artist Carl Ritger, who has been experimenting with sounds and textures for the best part of ten years, Radere first materialised three years ago with a series of remixes, compilation appearances and collaborations, followed by releases on Full Spectrum, Install Sound or Moodgadget over the last couple of years. I’ll Make You Quiet, published in digital format, is the debut release from Futuresequence as it makes the transition, or rather expands, from blog to record label. 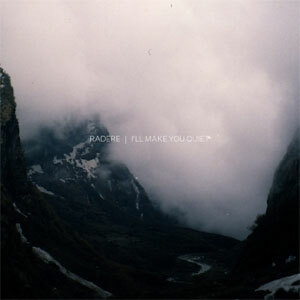 As Radere, Ritger creates sprawling organic soundscapes which develop over long periods of time. Built essentially from looped treated guitar textures, propped up by live instrumentation and electronics, his compositions are fluid pieces which often drift seamlessly from one piece into another. Whilst this is still very much a feature of this new album, Ritger voluntarily sets stricter boundaries for some of his compositions here to isolate them from the rest of the record and give them the chance to develop independently. Yet, I’ll Make You Quiet really works best as a whole as its flowing structures and changing tones resonate from one end of the record to the other. If there is nothing quiet about this album, Ritger works his sounds until pretty much all sharp edges have been smoothened, leaving very little distortion or glitch. If there are any, as is the case on Stay Away from instance, they are polished in, worked into the grain of the overall sound as to never disturb the balance of a piece. A notable exception to this is the opening title track, on which Ritger chooses to leave the rough saturated texture of his guitar in full view and actually places it about everything else. This is no My Bloody Valentine, but it still results in quite a visceral moment. There are brief hints of distortion on the opening seconds of Sometimes, I Can’t Make Full Sentences, but they are almost instantly swallowed by a dense nebulous cloud. Here, Ritger focuses almost entirely on low end sounds and noises, and while there are slight shifts in tones over the course of its nine and a half minutes, they are much subtler than on the sweeping cinematic …So I Left, by far the most overtly ambitious piece of the whole record, whilst also the shortest track on here by quite a margin. In fact, it appears almost as the pivotal moment of the record, placed as it is at its exact centre. As it eventually dissolves in a cluster of field recordings, it brings in the more muffled and rounded tones of Good Evening, Ghosts which slowly progresses, its overall shape forever morphing into something new, yet remaining almost untouched, slowly building up to the peaceful expanses of Stay Away. I’ll Make You Quiet sees Carl Ritger refining his approach whilst continuously expanding on his sound, working it ever more precisely to allow it to evolve or remain untouched without ever losing any of its focus and retain all its atmospheric density.